The Tugboat Syracuse sitting in Lock 24 awaiting the start of the Baldwinsville Boat Parade of Lights in Baldwinsville, New York. Nikon D700/28-300VR, 1.3s, f/16, ISO 200, EV 0, 98mm focal length, tripod. I heard about the Baldwinsville Boat Parade of Lights about a month ago. They said the boats would go through New York Barge Canal Lock 24. I immediately had a vision of the lock being full of boats with colored light displays. The reality was a bit underwhelming with the only boat in the parade being the Tugboat Syracuse. I hope there were more boats at the second meeting place further down the Seneca River. Not to be denied some lighted color, I moved over from the Lock Bridge to the Seneca River Bridge. 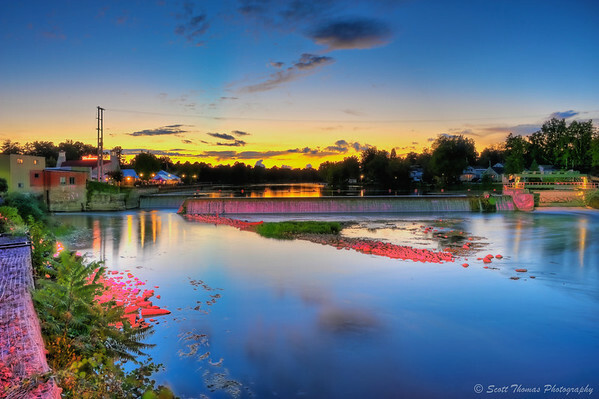 A few years ago, the Village of Baldwinsville using grant money from New York installed lights on both the bridge (see previous link) and the hydroelectric power plant’s waterfalls. Seneca River hydroelectric plant’s waterfalls in Baldwinsville, New York at dusk. Nikon D700/28-300VR, f/16, ISO 200, 28mm focal length, tripod, HDR image. The set of photos I took for this HDR image (seven in all) caught a mix of the colors which get projected onto the waterfalls, river and rocks. I zoomed in a little to focus on the sequence of colors which illuminate the waterfalls of the hydroelectric power plant. Fittingly, they came in Red-Green-Blue (RGB). Lighted sequence on the hydroelectric power plant waterfalls on the Seneca River in Baldwinsville, New York. Nikon D700/2-300VR, Varied Shutter Speeds, f/16, ISO 200, 100mm focal length, tripod. While I was disappointed in the boat parade, I looked and found other colorful things to photograph. Be open to other photo opportunities if the one you plan on does not work out. 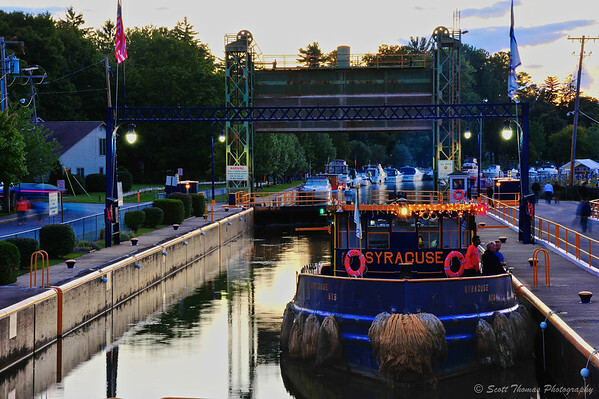 This entry was posted in Weekly View and tagged 28-300mm, baldwinsville, barge canal, colors, dusk, hdr, hydroelectric, lights, lock 24, new york, nikon D700, photomatix, power, rgb, seneca river, syracuse, tripod, tugboat, vr, water, waterfalls. Bookmark the permalink.